Heat oil in a pressure pan, add mustard seed, cumin seed, onion, tomato , ginger garlic paste, curry leaves, g.chilles & saute few mins. Add all powders one by one & cook until raw flavour extracts. Add chopped bottlegourd , channa dhal & water. Cook upto 1 whistle & check the seasoning. mmm. love this curry! looks so mouth-watering. Wow thats looking so delish .. Perfect for roti. Lovely dish, looks very nice. Bottlegourd is very healthy..n with dal combo it should be great..
Thats simple & comfort dish tooo. Looks delicious. Subzi looks simple and yummy. 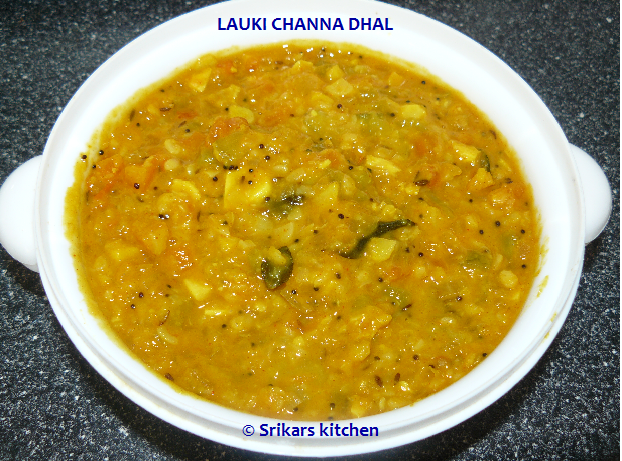 nice curry... i dont know much recipes with lauki... this will be useful. Goes awesome with rotis, delicious sabzi..
mouthwatering recipe simple and yummy nice pic. love this sabzi with roti, it looks damn tasty. mmmm, will love that with a chapati! WOw that looks thicks and dleicous. This is such an interesting combo. That looks super delicious, Sri! sounds simple and delicious sri..
Yummy subzi,I never tried with channa dal. A good authentic north indian dish...shud i say punjabi dish.Looks wonderful.Dint know lauki sabzi cud be ths simple..thanks for sharing.my friends mom used to add lauki in idli batter,it used to be yum...will try giving a shot to ur recipe.